Billy Graham’s casket lies in honor at the U.S. Capitol Rotunda. The Rev. Billy Graham, the pastor and evangelical leader who died last week and is being laid to rest in Charlotte on Friday, built relationships across party lines, illustrated by the praise Presidents Bill Clinton, George W. Bush, Barack Obama and Donald Trump delivered after his death. But it likely will be hard for an evangelical Christian figure in this era to get the kind of bipartisan acclaim that Graham received in life and in death. And these nonwhite evangelicals see politics differently than white evangelicals. 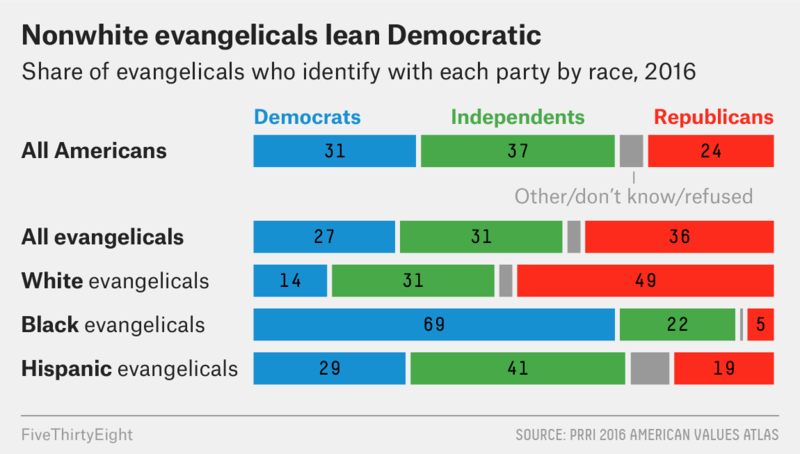 While the largest plurality of white evangelicals identify as Republicans, most black evangelicals are Democrats. A plurality of evangelical Latinos, in contrast, identify as political independents — and they’re less supportive of the Democratic Party than Latinos overall — but they are still more likely to consider themselves Democrats than Republicans. Non-Hispanic white evangelicals are conservative on a broad range of issues. They overwhelmingly backed the presidential campaigns of John McCain, who had at times criticized leaders of the “Religious Right,” and also Mitt Romney, despite some evangelicals’ discomfort with Mormonism. That overwhelming support for Republican candidates was evident in Trump’s election as well, as the GOP nominee won about 80 percent of the white evangelical vote in 2016 even though he’d been through two divorces, was accused of sexual assault and struggled to speak about the Bible coherently. In a recent New York Times op-ed, David Brody of the Christian Broadcasting Network cast Trump as God’s gift to evangelical Christians, arguing, “The Bible is replete with examples of flawed individuals being used to accomplish God’s will.” Congressional Republicans often defend the president, but few compare him to biblical figures. Secondly, on policy issues that some white evangelical leaders and activists care passionately about, Trump has delivered. He has embraced the GOP effort to block any federal dollars from going to Planned Parenthood, signed into law a provision that makes it easier for states to keep their funds from being used at Planned Parenthood clinics, reversed an Obama administration policy that directed schools to allow transgender students to use the restroom of whichever gender they identify with and backed a push to allow ministers to formally endorse candidates without the risk of losing their tax-exempt status. Brody may have an argument — but only if you limit your definition of evangelicals to the traditionally Republican, mostly non-Hispanic white camp. Since Trump has been in office, many prominent evangelical leaders, white and nonwhite, have criticized his cutbacks in the number of refugees allowed to enter the U.S., the president’s alleged derogatory comments about immigrants from “shithole countries” and his decision to end the Deferred Action for Childhood Arrivals program, which protected “Dreamers,” or undocumented immigrants brought to the U.S. as children, from deportation. It’s not that differences among evangelical leaders didn’t exist before, but they seem more evident with Trump in the White House. And the demographic changes only exacerbate them. On immigration policy in particular — an issue that Falwell and Franklin Graham have not publicly disputed Trump on — the sizable nonwhite segment of the evangelical community has obvious implications. “Evangelicals are very concerned about this, especially because so many evangelical congregations have Dreamers as part of our churches,” Russell Moore, a leader in the Southern Baptist Convention, told USA Today recently in explaining why he and other evangelicals were pressing Trump to resolve the DACA issue. Would you say that, in general, the growing number of newcomers from other countries …? American churches have historically been highly segregated, but according to Mark Chaves, a professor of sociology at Duke University who directs a periodic survey of American churches and other places of worship, diversity within congregations has been growing over the past 20 years. That gives pastors a reason to reflect on what policies and politics best suit their congregants. Churches where no single racial group dominates remain relatively rare, especially among evangelicals, but “we’re increasingly seeing diversity within predominantly white churches, and that’s likely to have a big effect on the way pastors approach issues around race or immigration,” Chaves said. For leaders who are focused on evangelism — that is, bringing more people to evangelical Christianity and keeping them engaged — embracing Trump and his controversial stances on immigration could actually be something of a liability. In contrast, several of Trump’s strongest defenders in the evangelical community, like Falwell and Graham, don’t run actual churches. This tension between inclusivity and political cohesiveness isn’t new for evangelicals. Billy Graham famously struggled — and many have argued, failed — to find a balance on race in the civil rights era. He integrated his Southern crusades, or revivals, at a time when integrated revivals were extremely rare, but he was unwilling to speak out forcefully against racism. But today, non-Hispanic white evangelicals are shrinking in numbers while remaining politically powerful, which presents a unique conundrum for evangelical leaders. Some, like the traditionalist Franklin Graham, are linking themselves closely to a controversial president, and in their view that alliance helps advance pro-evangelical politics. At least some other leaders, however, appear to have made the calculation that they’ll risk giving up some access to the halls of power in favor of a more inclusive message. PRRI defines “evangelicals” as respondents who identify as Protestant and evangelical or born-again. Other pollsters — in particular, the Pew Religious Landscape Survey, though not all Pew surveys — define “evangelical” by denomination and exclude some historically black denominations, which results in a higher share of white evangelicals. The 2014 Pew Religious Landscape Survey, for example, suggested that about 75 of evangelicals are white, a higher number than PRRI’s finding, but still a drop from 81 percent in 2007. A PRRI survey in December put that number at 72 percent.